Whatever your home-fragrance preference, we can offer a way for you to revive your environment, whether it is home or office, for every occasion and mood. Scents and smells can trigger a distinguishing mood or ambience in your home. You may not be completely mindful of its presence, but notice how vividly your memory is triggered when a place accommodates a familiar scent. (Remember the particular characteristics of how your grandmother’s house used to smell?). Obviously, we are not masking pongs here! Starting off with a clean and fresh environment is key to getting the full benefit of an inviting, enticing, and let’s face it relaxing space. Something you want to enjoy. 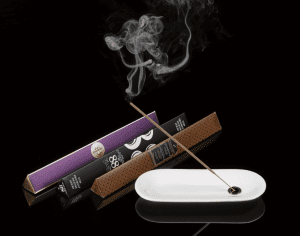 Incense sticks are a wonderful way to transform your home scents. Even in large spaces, limit yourself to burning a single stick at a time, as that’s all you’ll need. They’ve been designed to be potent; they truly do fill the room. Our favourite incense sticks are these No. 88 & Frankincense & Myrrh Incense Sticks, which include a Porcelain Holder and three different scents. You simply place the incense stick into the holder and light the tip, then gently blow out the flame. This will leave the glowing embers to smoulder and release the exotic fragrance. Each stick will burn for approximately 40 minutes. Light it in a central location and let it permeate slowly through the house. 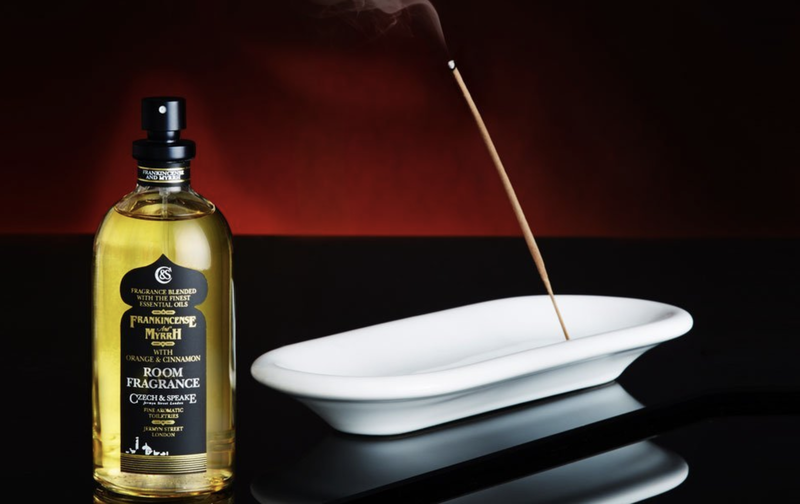 We now have revived our much loved Dark Rose incense, a deep sensual rose, smokey and beguiling. Alternate the incense sticks for mood and smoky depth. There are plenty of inexpensive candles out there, but to find a scent of true quality and taste is not so straightforward. 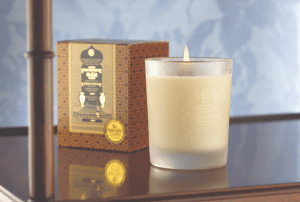 It is well worth investing in luxury candles to emulate the atmosphere of your home. While the quality allows for longevity, the carefully selected fragrance never becomes insipid. One tip to keep in mind is to not burn more than one candle aroma in a single room. Stick with a single scent to get the best results. For a luxuriously scented candle this winter, opt for our Frankincense & Myrrh Fragrant Candle 150g. Presented in an elegantly etched glass holder, the deep and exotic fragrance is blended throughout and burns for up to 35 hours. If you are more inclined to use a room spray, we’ve given you to option to have the same fragrance in varying forms. The Frankincense & Myrrh Room Spray 100ml comes with the addition of zesty orange and cinnamon for a fresh and long lasting, subtle scent. Oil burners tend to create a stronger scent than candles and the smell lingers for a little longer too. The burners come in many shapes and sizes, all working in the same way. In most cases, a tea light is placed at the bottom, and a small amount of fragrance oil is poured into the top. As the oil heats up, the fragrance is released. Start experimenting subtle scents when using oil burners because stronger scents can indeed be potent. Unfortunately Czech & Speake cannot offer these at this time. If you’re after some deep and fulfilling aromas and scents for your home, head over to our Home Fragrances section. For more tips on creating the perfect living space, take a read of our blog on How To Make Your Home More Intimate.